The significance of brochure in the fields of business and events is just something that is undeniably effective way of inviting prestigious guests and prospective consumers. The content in it states important information about a particular business or an event that you might be interested in engaging yourself into. You may have missed it at first when an event brochure was handed to you by a stranger with an unusually pleasing personality. At first, you thought that the event written in the brochure is a total waste of your time, but when you read it you actually find it appealing to your interest. 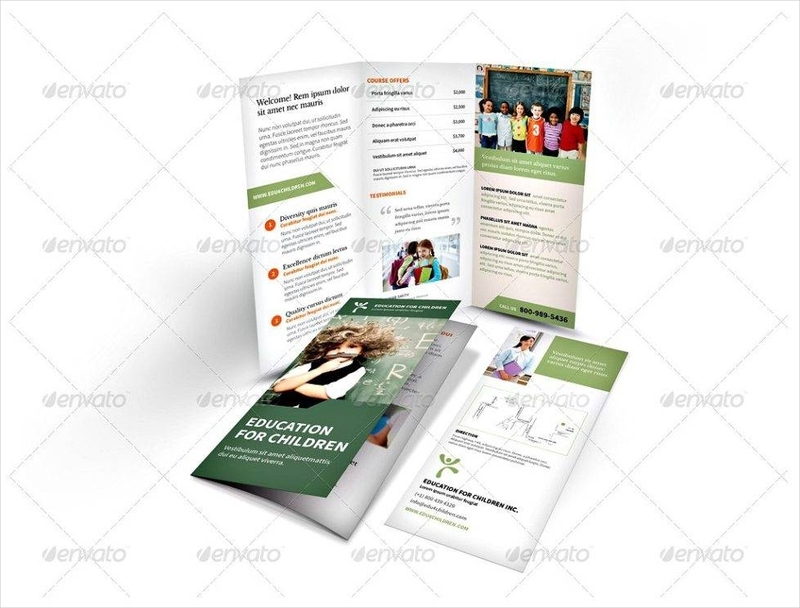 Besides event and company brochures, we also have education brochure to inform people, specifically parents, who are inclined to let their children have the best scholastic training to grant them only the best when it comes to their desired future. If you wish to create education brochures to grant these concerned parents their satisfaction, then reading the whole thing in this website will do you justice in spending a little of your time. 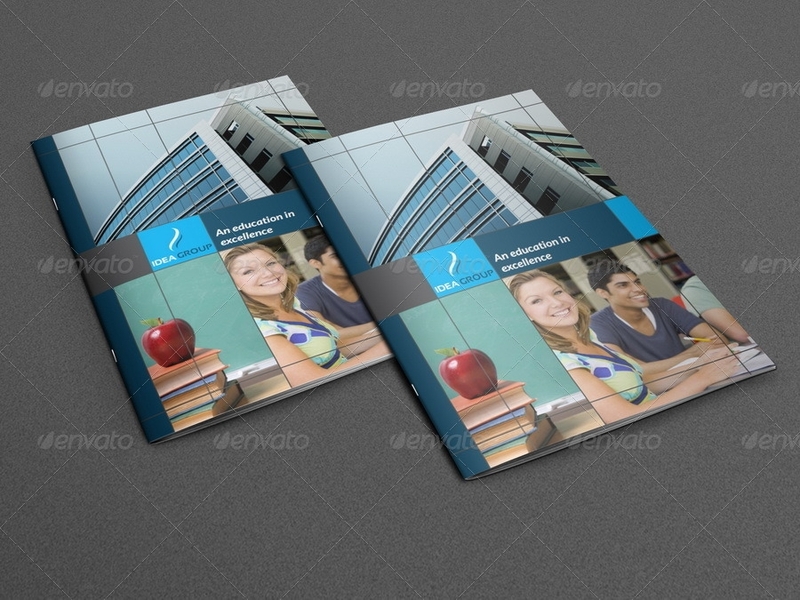 Here are education brochure examples that might just give you and idea. 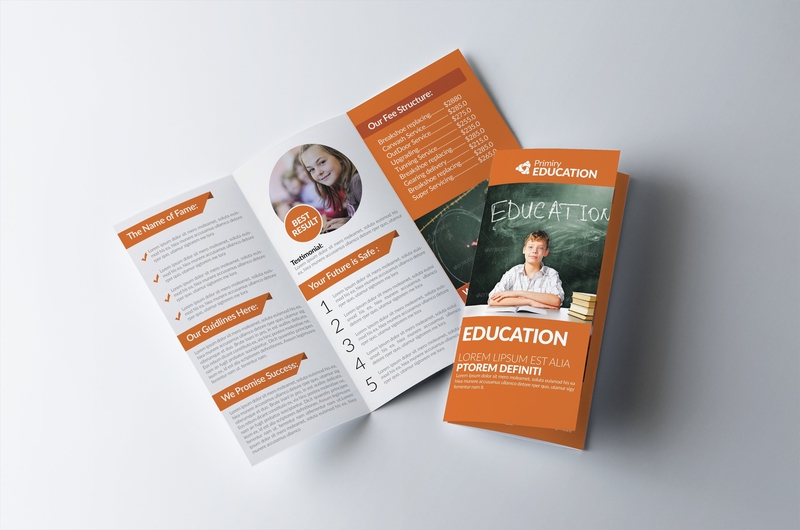 Education brochures, like advertising flyers, serve many a school and university lots of benefits. As one of the most effective methods of marketing, a brochure is something that invites people, as what holiday invitation does, to be interested in a business and, thus, compel them in to participate or become one of its consumers by means of exchanging interests, of course. From generations to generations, the role of the brochure has never changed and it still is in existence in the digital era. Almost everything is done and discussed on the various social media sites, yet many people still wonder why brochure distribution is still a thing. Here is a list of advantages of brochures to explain why they are never faced out in strategies of an effective marketing. 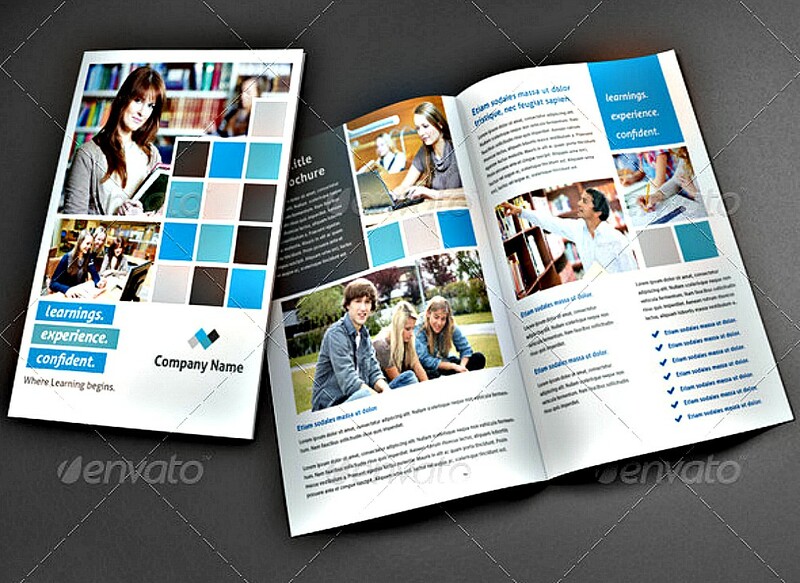 Brochures are a storage of information with great importance to a business. Although the cyber world is too, the brochure is more convenient to interested persons for the vital information are stated directly. Once the brochure is done, the customer will be imparted with a knowledge about your company and how everything came to be, pictures of the products, or what an establishment does. If they happen to be interested, phone calls will be on the queue because of customers wanting further inquiries. 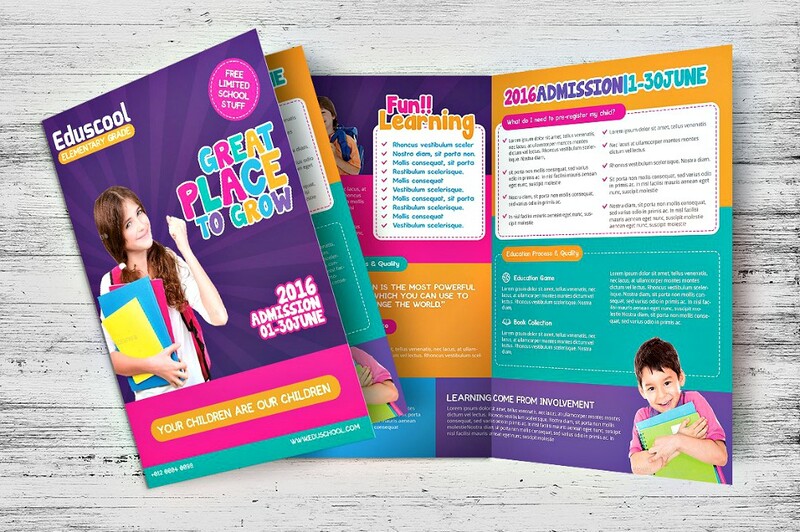 If you compare producing a number of brochures with creating a website for the school, you can save a whole lot of money from the former, especially if ordered in great quantity. No brochures will ever become a waste for these can still be used in the future, that is if the brochure is effective. It is not very often that people would visit a website not unless if the action happens to be intentional, which means a slow spread of information and wasting a lot of money and website of the school. Since brochures are distributed to random people, they actually read if they find it interesting and let their friends know more information about a company, product, event, or school should they be interested in it. Education is one of the most important keys to opening the doors of opportunities. It is deemed vital to everyone since this grants them a huge amount of hope in the near future knowing that the cruelty of this world is indifferent to both those who know little and know enough, yet it’s a lot better to be the latter, right? Although some would say that the pursuit of education is not at all necessary as others propose because of the successes of famous people who dropped out college, it must be perceived that education inspired their curiosity turning them into sages in the early stages of life. Some of them even continued to study despite the fortune that could finance five lifetimes. 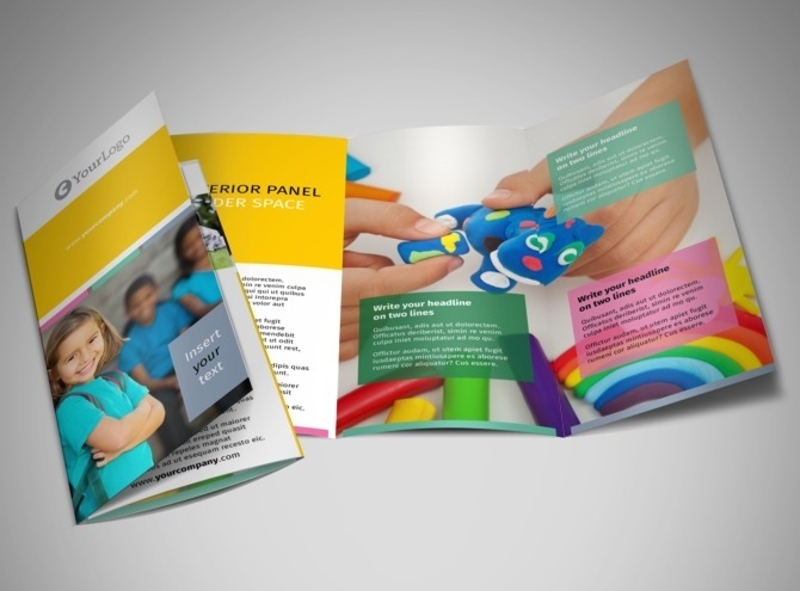 Designing your very own brochure can be quite a challenge, especially if you have never experienced in creating one. Just thinking about designing it is already stressful to the mind and a sigh of giving up can be expected, and trust me that wouldn’t be at all very shocking. 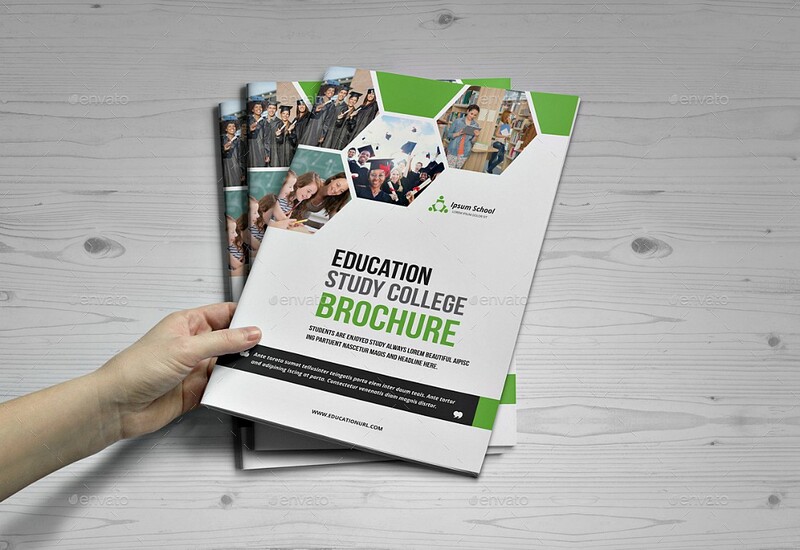 If your mind is on the verge of collapse because of your work plus designing a brochure, ease the creasing of your brow because we are more than delighted to see you not break a sweat by means of giving you advice on what are the important things to be borne in mind in designing your very own education brochure. Knowing what the purpose of your brochure is necessary for this to become effective. You should associate ideas together with your clients to acquire their objectives and for you to discover the flaws of a recent brochure that turned out to be a failure, that is if a brochure has been used already in strategic marketing. Make sure you coordinate with them fully and, if clarifications and questions needs are raised, go ahead and do it. 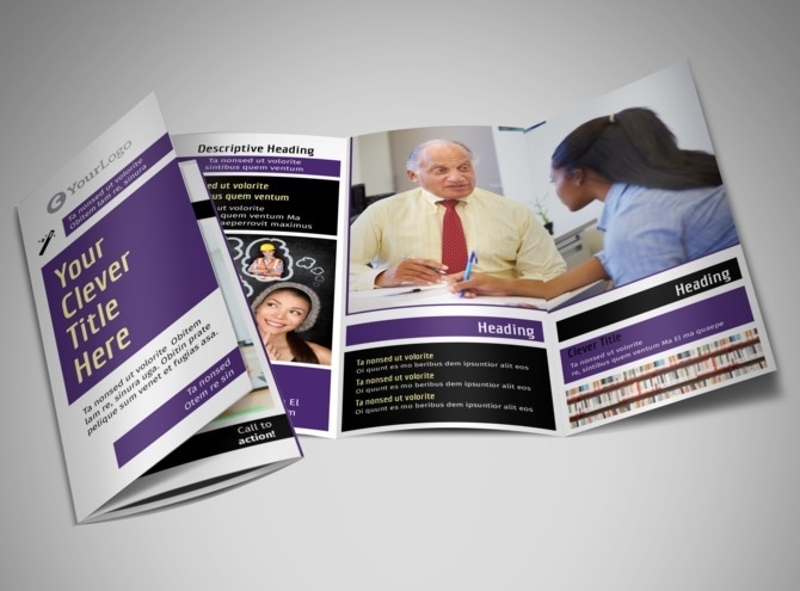 Besides knowing the purpose of the brochure you will be designing, you also have to know who you will be addressing to. You need to imagine yourself in their shoes and ask yourself: What is it that makes an education brochure interesting? From the mention of the word education, it is already boring enough so the growth of mental frustration will be a natural thing that you need not worry about for this can be tolerated and resolved. School activities that inspire fun should be thought thoroughly and highlighting the positive impact it brings to students is a must is one way of bringing out the fun side of school halls from the cursed with boredom that is schools and universities. Having a blueprint of your plan guarantees that working on a brochure will be an easy task. This helps you map out your ideas in a well-coordinated array. Through this, you will be able to identify what possible errors will be on the way and, thus, close the loops of faults. Always remember no matter how reputable a business, company, or school may be, the school or company logo is inefficient obtain persons’ interests. Similar to flyers for photography, photoshoots are necessary if you really want to obtain the trust of people since this photoshoot catches the actual footage of students that are having fun while learning. This can be done in candid or not. You can also use free images from different websites that are relevant to the type of brochure you are working on. Although these images are offered generously without costing you a dollar, we highly suggest you make mild changes by means of Photoshop or free editor websites or app for the images to correspond flawlessly with the pictures taken from the photoshoot, especially when it comes to the toning of the color. Images should also be catchy just like the images you see in advertising posters. 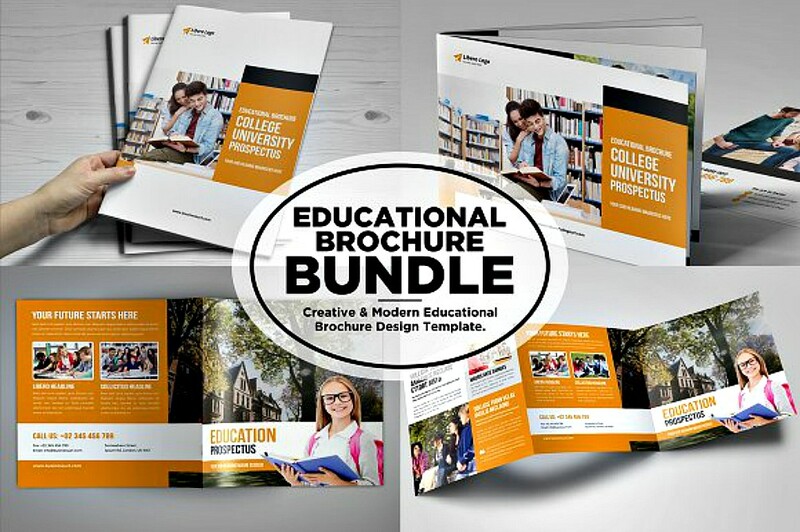 If your clients want to make references of other education brochures, then you have to check a lot of education brochures and distinguish which of the brochures pique your interest. Once you have chosen which one you will base your work on, you have to carefully study everything in it and identify what are the qualities that make it an effective brochure. The clients might suggest you use the same font style and you personally think that the font style is one of the many factors which makes the brochure perfectly pleasant to look at, then go for that font style. 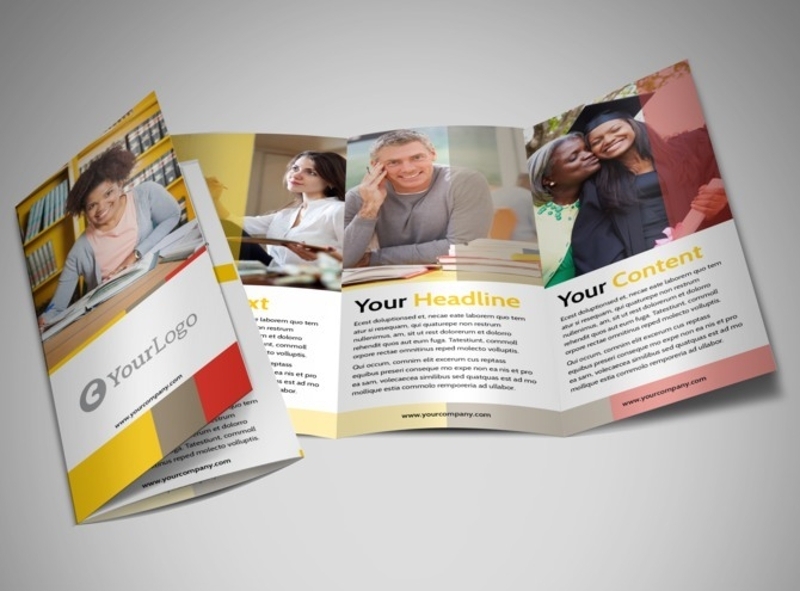 You have to keep some conventional or most used styles that make a brochure compelling to the readers. For example, a brochure with all plain comic sans text wouldn’t be taken seriously. 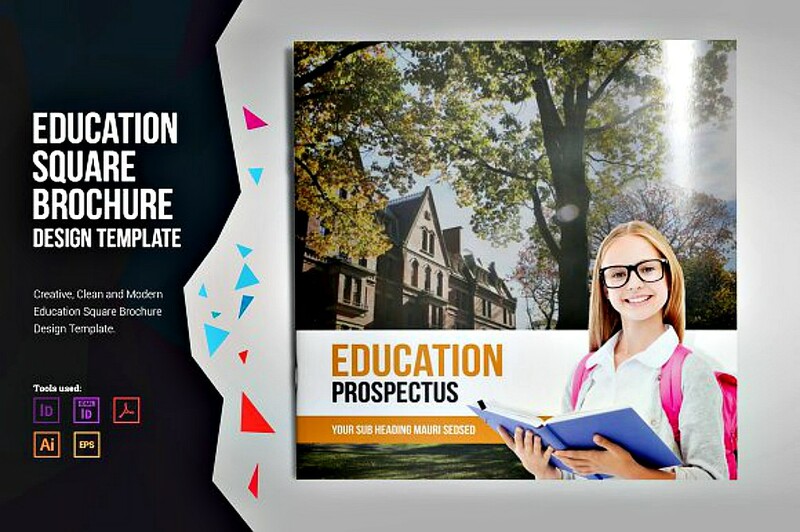 In creating a content for education you might want to keep the tone professional yet very inviting so that the brochure won’t seem like endorsing a school or university that only serves knowledge in the most boring way. 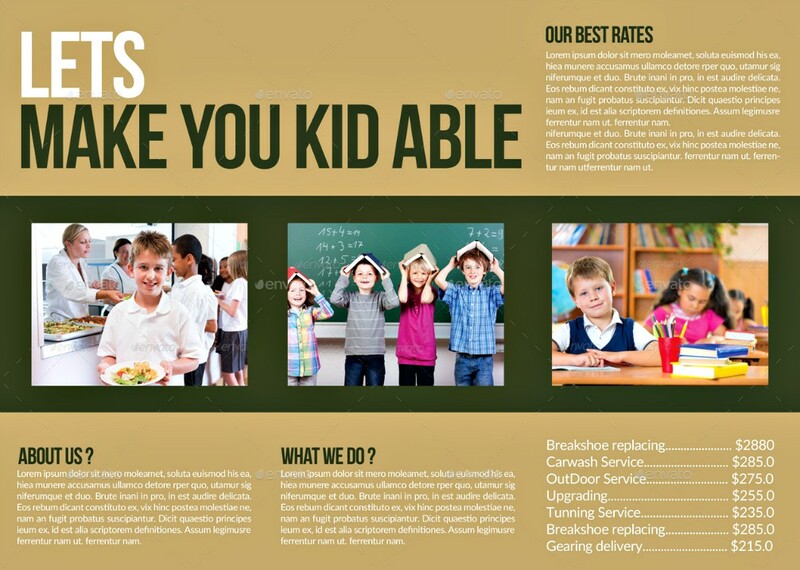 Educational activities should manifest in it to make the brochure bright and pleasant to read. After making a scratch of your writing you have to read the brochure as if you were a parent who wants to enroll your child in a prestigious university. 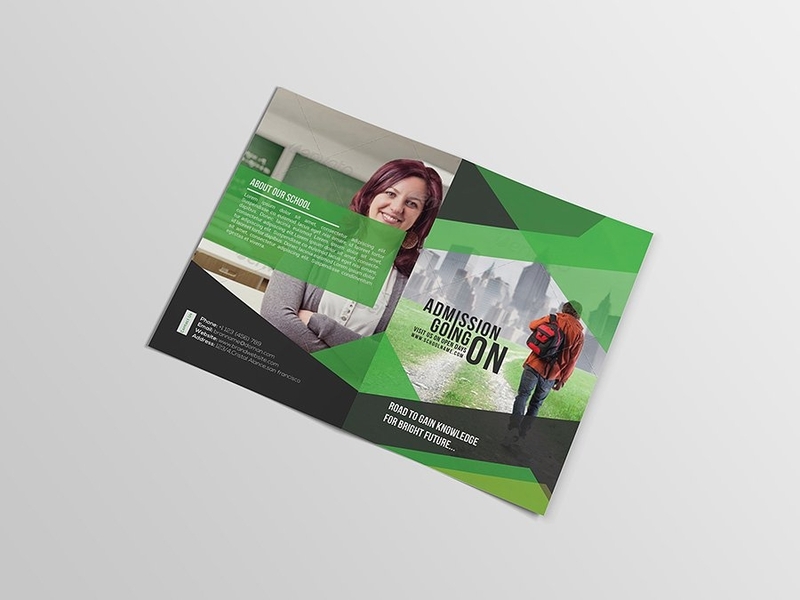 When you are given an education brochure you will unconsciously set your standards about the most ideal school or university, so it is important to take note that in opening the brochure the content should be appealing regardless of what is offered by the school or university. Although the school or university that you are working on is not as generous as others offer, choosing the most fitting words for your content would justify your work, and the chances of parents asking for further inquiries about the school would ascend to a percentage you desire. In order to build trust with your reader you have to check if the tone of your content is inviting or not. The tone should be lively while keeping that air of formality in being informative. This builds trust and won’t let readers consider the benefits as fallacious, or that there are many prestigious schools or universities out there who can do well. You have to imagine that you are talking to your reader and make everything as if it’s a personal conversation, which makes reader want to respond to what you are endorsing. 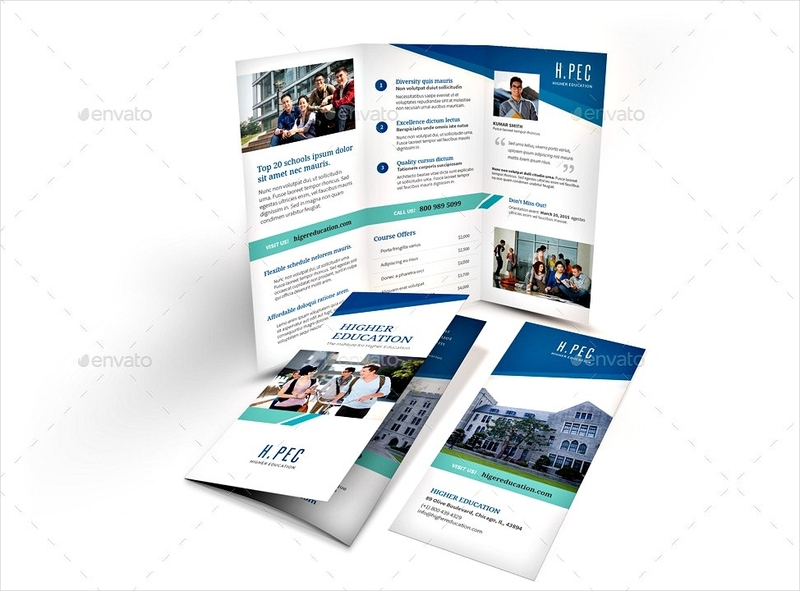 The first page of the brochure has to be deliberately planned out because once you mess it up, your efforts in making a perfect brochure will turn out to be an absolute waste. To get this right you can cite the benefits of enrolling children to this school. With catchy statements which make readers expect a surprise, the chances of checking the content of the brochure is high. 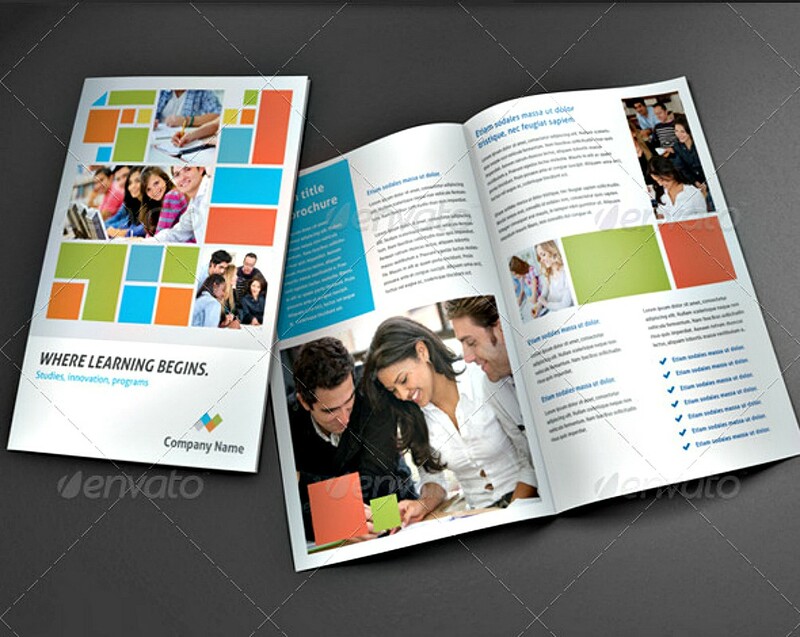 Brochures are meant to be a storage of information for certain products, events, and business. Make sure to state all the vital information of what you are promoting or endorsing for people not to let go of it, and check on from time to time or they might even let other people read it.The reason why interested people keep it is not only because it’s important information but, too, because of the instructions and phases of an enrollment process that they are expected to do. Don’t waste the space of a brochure with your fancy and flowery words and just get straight to the point. You certainly don’t want your brochure to be a waste of time to people. Focus on the benefits and the reason why they should let their children take the entrance examination.